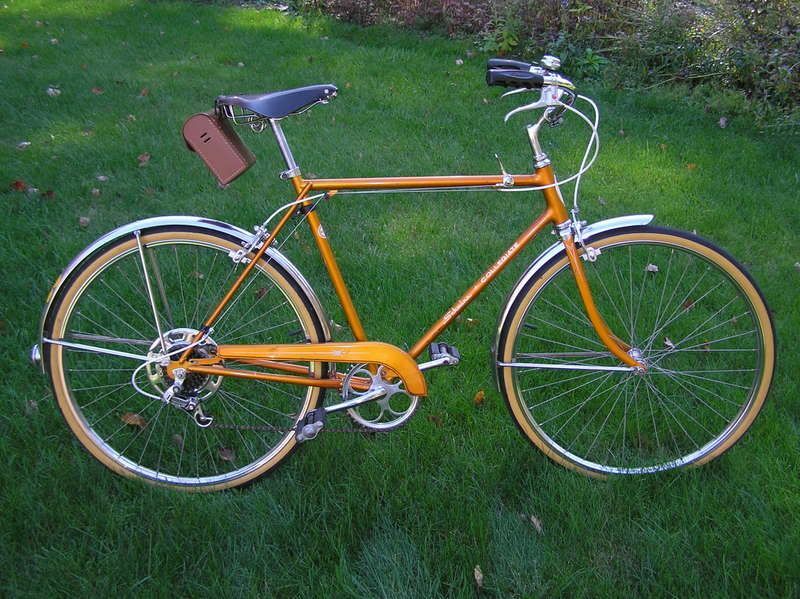 I'm fixing up a Schwinn Varsity and i am having troubles with the seat. I can only get the seat clamp (the one that holds the seat to the post) so tight, but not tight enough. As the bike is being ridden , the seat tends to still tilt, though it takes some force to do it. The bike has the original seatpost, which from research on here, is the 13/16" diameter, and it tapers smaller at the top. The seat clamp is designed for two rails on each side. I do have a two rail seat on the bike. I would like to replace the seat with something more comfortable. First, will the seat clamp work on a single rail, "regular" style seat, or do i have to get a different clamp? Assuming that's the way to go, is there a suitable replacement seatpost that will work in the Varsity frame? I'm not looking for anything fancy, just something that will work. What is the closest, modern size that may be available through an LBS or Nashbar that would work? An idea i had, would be to simply flip the seatpost over, inserting the tapered end into the frame and using the larger diameter with a different seat clamp. How much of the non-tapered seatpost should remain in the frame for this to work? Would this idea even work, and if not, why? My apologies on the long post. I know there is much ridicule of the Varisty, being old, non-standard and very, very heavy. Please bear with me, i understand they are not highly valued, I would just like to keep it riding. Thanks everyone in advance for your help. No modern seatpost work in the old Schwinn Electro Forged frames. I've had trouble with the double clamps not holding as well. They will spin on some posts but not on others. I find that the heavier chrome models hold better. I've made two custom posts for EF frames. The first is for my Collegiate and it has the double rail clamp. It's a piece of gas pipe from ACE sanded down to fit in the frame while the top holds a larger double rail clamp for a Brooks B-72. The second is for a Continental. I shortened a BMX post and used epoxy to secure it to the top of a Schwinn seat post. I needed further set back. Both look OK and get the job done. Best of luck. The layback BMX post is just great. Good idea, and looks super smooth! 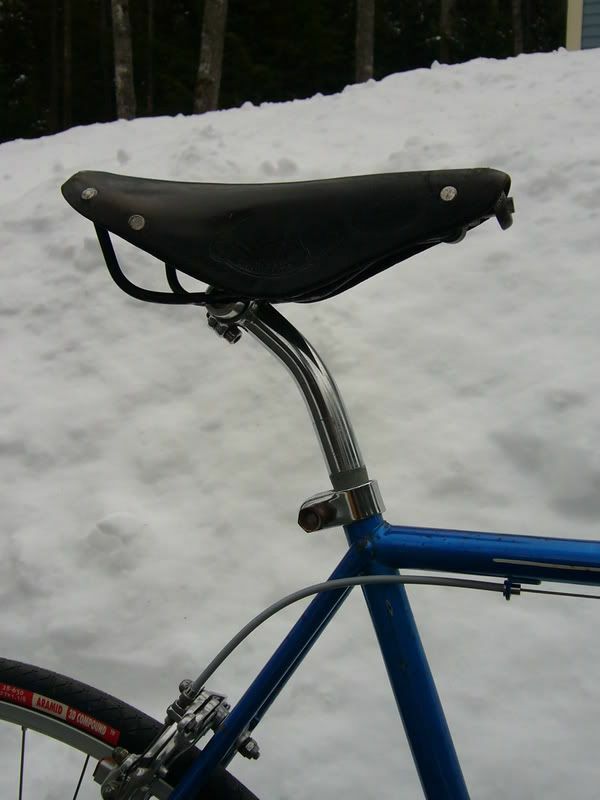 My '67 Varsity seat would also tilt (only with substantial force applied) even when everything appeared tight. o The seat-clamp needed a shim at the top of the post - the clamp was being overtightened, misaligning the clamp's adjustment surfaces for seat-tilt and minimizing contact of the radial grooves, allowing the surfaces to slip. This seat-post clamp is the irreplaceable item to preserve if you want to continue using the alum post with the taper top. Given the fact that I also needed a shim at the frame end of my post, I have a feeling it's a hair narrower than it ought to be. o The seat-angle adjustment surfaces had a mismatched number of radial grooves (!). Apparently, someone had replaced the "outer" twin-rail clamp h/ware and didn't notice that it had a coarse pattern of grooves and the post clamp had a fine pattern. The above two conditions complement each other perfectly, since the ever-tighter seat adj'ment nut simply misaligns the two inner adjustment surfaces to a greater degree, providing less friction by reducing the contact area with the two outer surfaces... *and* the adjustment can't ever really "lock" in *any* position, since the inner and outer surfaces can't mate. Nice, huh? If you have absolutely no consideration for weight - and let's be honest, given our chosen steed, we are certainly both suspect - the WALD 955 ..heavy thick steel.. seat post has the 20.5+/-mm frame requirement stepped up to 22+/-mm at the top, with a stay-collar, to fit modern/std/not-impossible-to-come-by seats/clamps. I bought one, just to have as insurance, at a decent LBS in SF (Valencia Cyclery) for $10, I think. This may match what someone mentioned was being sold on eBay in a similar post elsewhere. I don't know at all about "single rail" seats. Of course, I rarely go the easy route. I ended up shimming the seat post so the clamp was quite tight and had its two adjustment surfaces eyeball parallel. Mine took two small pieces of thin steel shim stock. "Fixing" the adjustment surfaces was an experiment. I used a tri-edge-rat-tail file to get the original radial grooves in the seat post clamp as aggressive/sharp as I could. Because of the mismatch in pattern, the angled contact, and years of slipping, some sections of the two surfaces were wearing smooth. Fortunately, the seat clamp seemed to be made of the better quality metal, so most of the wear was at the seat-rail-clamp surface. With new/salvaged seat-rail-clamp h/ware, I made two aluminum washers from "can" stock that fit between the two adj'ment surfaces. I installed the seat and tightened it up. I rode it for a bit and it seemed solid. Upon disassembly, the washers were perforated by the radial grooves, but the punctures were evenly spread around the radius, so things were parallel enough when compressed tightly. The aluminum "spread" into the gaps at each adjustment surface to effectively "lock" them. I re-made the two washers from .032" alum shim stock (Ace h/ware). By tightening the bolts securely, the radial grooves "bite" into the alum, which is thick enough not to perforate, but soft enough to receive the groove pattern and provide enough friction to prevent slip - so far, anyway. If I had to do it again, I'd go for a slightly thinner guage stock, judging by deformation (ie: I want to see a little more groove pattern squeezed into the alum). Have I been brave enough to actually attempt to adjust my seat angle? Fortunately, I got the angle right when I put it all together - one possible advantage of owning a bike for most of your life. In case I did need to adjust it, I later put a small amount of the "flowable" silicon in the narrow edge between the rail-clamp face and the washer, to glue the washer onto the outer surface. If I ever(!) loosen the seat clamp nuts, the seat should be able to "step" through an angle adjustment, defined by the pattern created on the inner-washer-face by the seat-post clamp's radial grooves. That's the theory, anyway. Good luck - if any of the above is unclear, ask away. Thank you everyone for the replies. It's taken me much longer to post back than normal, and i haven't gotten a chance to work on the bike recently. I'll definitely look into getting a Wald 955 post. Weight is definitely not a high concern, i just want the bike to be a good neighborhood ride and be mostly reliable and worry free. I'm looking into getting new brake pads, tires and cables. Again, thanks for all the helpful information. Pastor Bob, beautiful bikes as always. Pohlf, thank you for the seat clamp idea, it sounds very well engineered.